At one point during middle school, I owned 14 pairs of Cole Haans. Most were men's. There were many loafers. A beautiful woven suede with brown cap toe (actually for women). Tuxedo shoes. 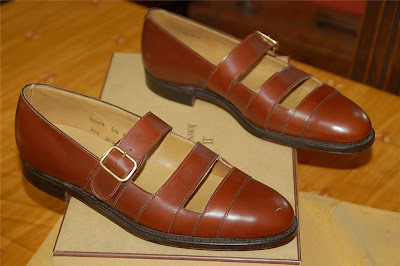 And two pairs of sandals that basically looked like these John Lobbs. In fact, I picked up my first pair of these mandals on my first trip to San Diego. I'm back there this week for another day job obligation. Temperatures are wildly low, so I've been spared from seeing the flip flop contingent. Thank goodness both CH and JL realize that men should never show a toenail in public. These are like sandals with a decency cap. You can pick up these size 7.5 Lobbs for $425. Nice design!! Got a pair of similar designed sandals for my younger daughter from eBay at very genuine price.